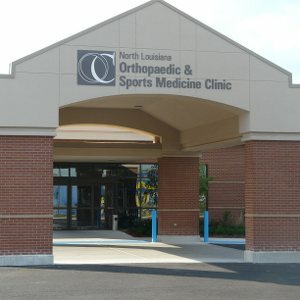 After many years of growth and expansion, the North Louisiana Orthopaedic and Sports Medicine Clinic of Monroe, Louisiana chose Lincoln Builders of Ruston, Inc. to consolidate several offices into a 32,300 square foot state-of-the-art clinic for 13 doctors with a rehabilitation center. Since the lease on their main location would be up in 13 months, it was imperative that the project go smoothly and stay on schedule so their new facility would be ready for move-in at the end of their lease. Lincoln designed the project based on preliminary programming by the owner and completed construction on time with substantial savings returned to the owner. “The design/build team concept Lincoln Builders proposed, with the owner, architect and contractor all working toegther and not against each other, is as good as it gets. Lincoln delivered on everything they promised.” Tom Bryant, CEO, North Louisiana Orthopaedic and Sports Medicine Clinic.